All workers should be properly fitted with the proper respirator. The safety expert should not only make sure that the employees understand the importance of respirator use, but make sure the employees are using them correctly and check back from time to time to insure that they are actually using them. 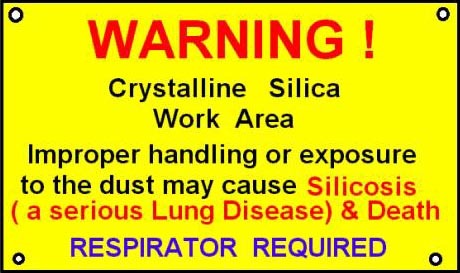 Further safety experts should instructn the silica workers that paper dust masks do not prevent silicosis. These paper masks are not fitted and allow the worker to be exposed to free silica dust. Signs should be posted to warn workers about the hazard and specify any protective equipment required (for example, respirators). The sample sign in below contains the information needed for a silica work area where respirators are required.